Driving by car, a popular route is to take the M5 southwest, then to join the A30 at Exeter. 1. Leave the A30 at the large roundabout on the approach to Hayle (Loggans Moor roundabout). 2. Take the exit into Hayle and go straight across the double mini roundabout. 3. Turn right opposite petrol station, following brown tourist sign to Beachside Holiday Park. 4. Our entrance is approximately quarter of a mile on the right. 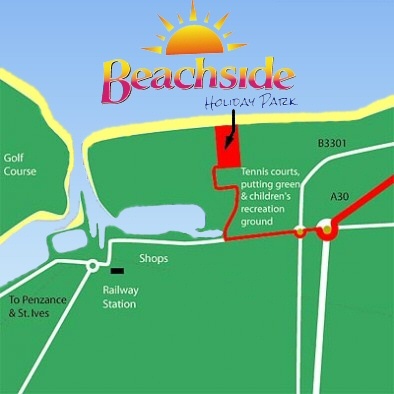 The Beachside Holiday Park postcode is TR27 5AW.